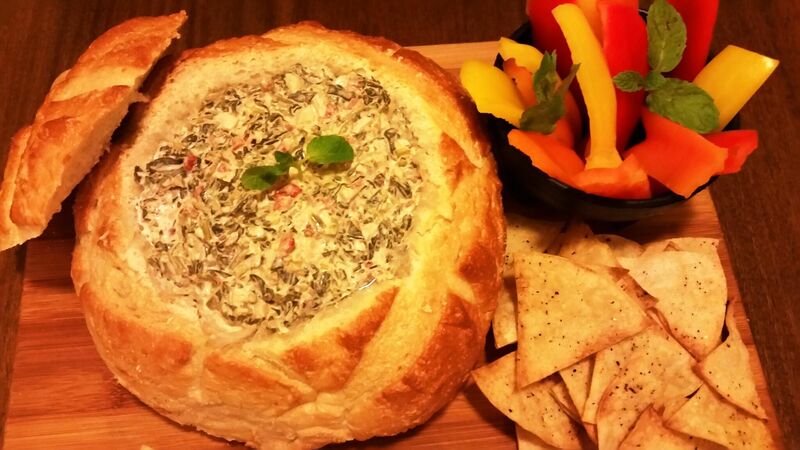 Kickin’ Cali Collard Dip served in hollowed out, round sourdough boule with baked tortilla chips & bell pepper medley. The American Gaming Association predicts that American sport fans will bet about $4.7 billion on the 51st Super Bowl game match up between the New England Patriots and the Atlanta Falcons. That’s a whole lot of clams, cash, moola, duckets, Benjamins and greens. I don’t know the odds of which team is more likely to win the coveted trophy. 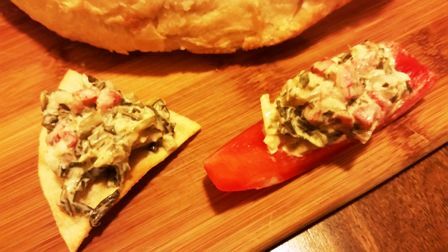 But I do know that if you bet your greens on my Kickin’ Cali Collard Dip, the odds are you will score a tasty touchdown. Kickin’ Cali Collard Dip is a great departure from the usual suspect. It’s made with collard greens instead of spinach. The use of garlic and red onions compliment the greens perfectly. The crushed red pepper gives it a spark. And the secret ingredient that takes it over the top is freshly chopped mint. Yes – fresh mint. You can even add chopped bacon bits, lump crab meat or bay shrimp it you want. Let your imagination be your guide. Serve it with my tasty homemade, baked tortilla chips or a medley of sliced bell peppers as a low carb option. You gotta score this recipe. Make it a tradition. Make it for your Super Bowl gathering. Make it any time. It’s a touchdown in taste. Give it a try and you will see how kickin’ it really is. Optional ingredients: ¼ cup chopped bacon bits, ½ cup bay shrimp or lump crab (but you be the judge). Add sour cream and softened cream cheese in a mixing bowl. Whisk very well, until well incorporated and smooth texture. Drain collard greens well. You may want to put them in a colander or strainer and press out as much liquid as you can. Add greens and all remaining ingredients into cream cheese and sour cream mixture, and mix well. Refrigerate at least one hour before serving. Serve with tortilla chips or vegetables. Cut each tortilla into 8 chip sized wedges and arrange the wedges in a single layer on a cookie sheet. Spray each tortilla wedge until slightly moist. Sprinkle tortilla wedges with lemon pepper and sea salt. Bake for about 7 – 8 minutes, or until the chips are crisp, but not too brown. Are you ready for some football and a Kickin’ Cali Recipe? 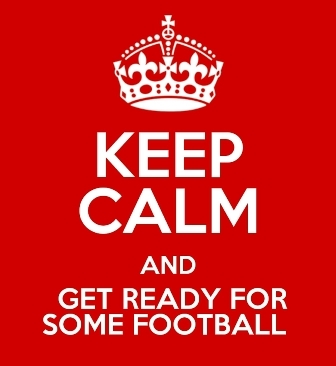 Yes we are ready for some football!